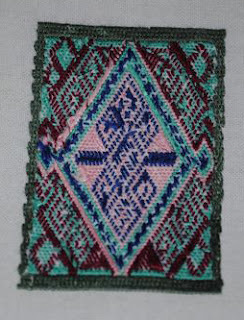 Somewhere in my web-browsing in the past few months, I came across a reference to a project involving embroidery created by village women in Afghanistan. The project is facilitated by an organization, begun by Pascale Goldenberg, and based in Germany. Pascale receives small squares of embroidery from women in Laghmani, north of Kabul, and offers them for sale. A quick review of Pascale’s website, www.deusch-afghanische-initiative.de, suggested that these were amazingly intricate designs and, also, that it was easiest to arrange purchase if one were in Europe. I filed away the info until a few weeks ago and then arranged to purchase a few squares and have them shipped to a B&B where I would be staying in France. Pascale was happy to ship to me in France and trust that I would send payment from France once I had received the squares. All the logistics worked and I received three small rectangular pieces when I arrived in Paris. They are stunning. Each reminds me of what I might see in a Persian carpet. The small rectangles are each about 2” x 2 ½”. It is difficult to comprehend the artistry of the pieces from the photos. To give you a better idea, I have includes the reverse side of one of the pieces – it is hard to tell it is the back. I haven’t decided what I will do with these pieces yet, or if I will order some more. It is not impossible from the U.S., just a bit more red tape. For now, I am pleased with what I have received and knowing that in purchasing these miniature works of art, I am helping to support a group of women who live in dire conditions. Hope you will take time to visit Pascale's site and learn more. What beautiful little works of art! I managed to find Pascale's blog; her work is inspiring. Thanks for sharing! Very Nice, I think these can sell in the USA and help the afghan women they need to make it easier.